Random House Trade Paperbacks, 9780812973327, 336pp. 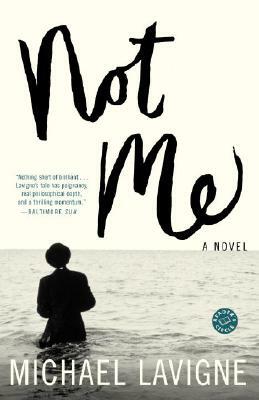 Not Me is a remarkable debut novel that tells the dramatic and surprising stories of two men–father and son–through sixty years of uncertain memory, distorted history, and assumed identity. When Heshel Rosenheim, apparently suffering from Alzheimer’s disease, hands his son, Michael, a box of moldy old journals, an amazing adventure begins–one that takes the reader from the concentration camps of Poland to an improbable love story during the battle for Palestine, from a cancer ward in New Jersey to a hopeless marriage in San Francisco. The journals, which seem to tell the story of Heshel’s life, are so harrowing, so riveting, so passionate, and so perplexing that Michael becomes obsessed with discovering the truth about his father. As Michael struggles to come to grips with his father’s elusive past, a world of complex and disturbing possibilities opens up to him–a world in which an accomplice to genocide may have turned into a virtuous Jew and a young man cannot recall murdering the person he loves most; a world in which truth is fiction and fiction is truth and one man’s terrible–or triumphant–transformation calls history itself into question. Michael must then solve the biggest riddle of all: Who am I?Intense, vivid, funny, and entirely original, Not Me is an unsparing and unforgettable examination of faith, history, identity, and love. Michael Lavigne was born in Newark, New Jersey. He began seriously writing fiction only at midlife and was a participant of the Squaw Valley Community of Writers. Not Me is his first novel, and he is currently working on his second, set in Moscow, where he once lived. He lives in San Francisco with his wife, Gayle.